Gather 'round folks, I have a Play Store discount for you and this is one you can all benefit from. Yes, for once, this deal isn't limited to a few European countries plus Mexico, Brazil, Australia, and maybe India. Nope, this deal is worldwide, or at least it appears to be valid in more than 25 countries that I checked going from Indonesia (IDR 1500) to Bulgaria (BGN 0.20), Switzerland (CHF 0.20), South Africa (ZAR 1.50), Lebanon (LBP 200), Canada (CAD 0.10), the United States (USD 0.10), and more. The discount is hitting the Guns'n'Glory Premium game, a 4.5-rated strategy action title where you play the bad guys. 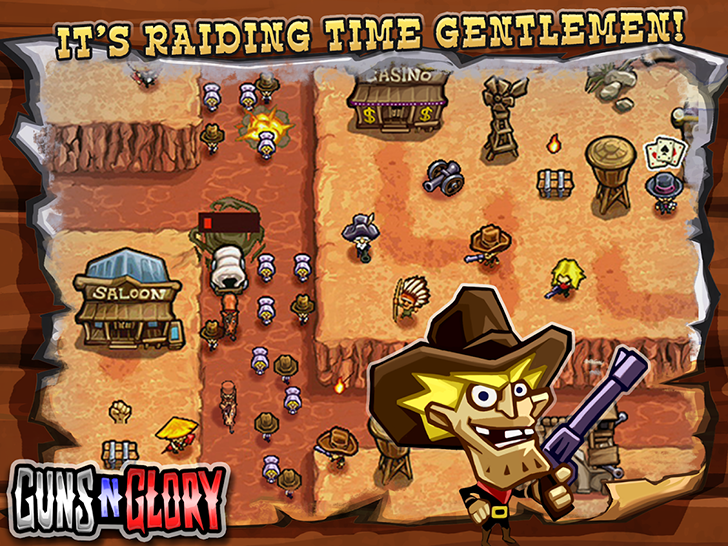 You choose from different bandits and unique gangs, arm them, blow up things to conquer new territory and collect power-ups, upgrade your unit, and more, all in a cartoon-inspired Western setting. There's one drawback to this deal: even though this is the Premium version of Guns'n'Glory and it normally costs $1.99, the game still shows ads and has IAPs according to the reviews. That's a very disappointing cash-grab strategy, but at 10 cents, it's slightly more palatable.